Humanity has been gifted with art. Art has been in existence since the start of humanity and there are so many art forms developed in the corners of world. One such art form is Block Printing. Block printing is a special art form that was developed in China in 868 A.D using wooden blocks to print or paste colours and patterns on fabric. This technique then reached India in the early 12th century and majorly flourished in Rajasthan, Gujarat and Kolkata. Today, Rajasthan is one of the prominent states in India who has mastered the art of block printing In Rajasthan, block printing is primarily done on the cotton fabrics. The dyeing of cotton fabric was natively developed in Rajasthan. The block used for printing is a large, smooth wooden block fixed in a place with characters imprinted on the other side. This art form allows great artistic freedom using different characters including geometrical shapes, fruits, birds, animals, etc. Block printing is a mixture of characters in repetitive or different patterns forming a beautiful design work on the fabric. It was an art form used to descript stories and tales also in the olden times. This art form was initially used for decorating tents, when it was taken up by the royal houses and used in royal processions which helped in spreading its footprint all over India. With the advent of the British Raj, the art form was spread further globally in the form of trade in the 17th century. Thank to the British Raj, block printing continues to be that one Indian traditional art form that has been in demand in the foreign markets especially in Europe. 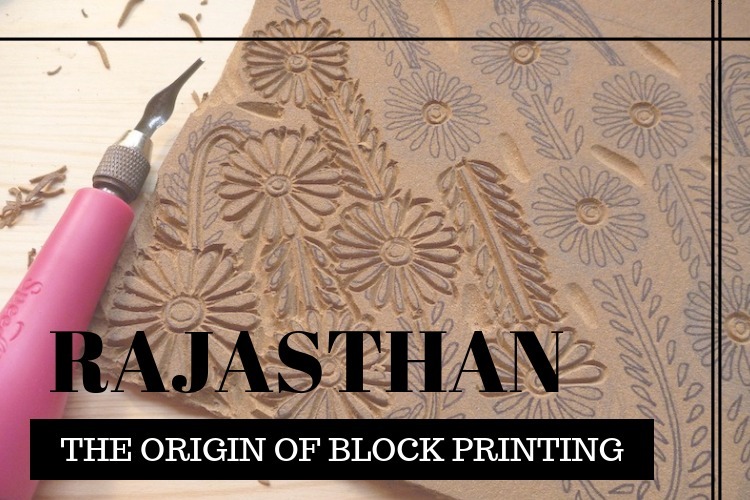 The important cities in Rajasthan for block printing are Jaipur, Bangru, Sanganer, Pali and Barmer. Sanganer is famous for its calico-printed bed covers, quilts and saris. In hand printed calico prints, the outlines are first printed, and then the colour is filled in. Bold patterns and colours are very popular in this type. Doo Rookhi printing is also famous in Sanganer. In this technique, artists print on both sides of the cloth. Bagru is famous for its Syahi-Begar and Daboo prints. The former are designs in a combination of black and yellow ochre or cream. The latter are prints in which portions are hidden from the dye by applying a resist paste. Barmer is known for its prints of red chilies with blue-black outlines, surrounded by flower-laden trees. The other famous prints are of horses, camels, peacocks and lions, called Sikar and Shekahawat prints.